Lesson 009 How is college? Mari: Hi, Sho. It’s unusual for you to call me. Sho: Yeah, I know. Are you having a party? Mari: Year. It’s a party for new students at the college. Mari: Sorry? Can you say that again? It’s too loud in here. Mari: It’s great! Art school is a lot of fun! Everyone has so much personality. Sho: That’s great! Um…so, I have a question. Are you taking over the ryokan? Mari: What? I can’t hear you, Sho. Sho calls his sister Mari. She is in the middle of a party at her college. Sho tries to talk to her, but she says, "I ( )( ) you, Sho." Lesson 010 Are you taking over the ryokan? Mari: Is something wrong, Sho? Sho: Well… where should I go for high school? Mari: I thought you wanted to go somewhere nearby. Sho: Listen, Mari…are you taking over the ryokan? Mari: Of course not! I will become a picture book writer, and make children happy! Sho: Then who is going to do it? Mari: Well, what do you want to do, Sho? Sho: I don’t know yet. Mari: Great! Then you can take over the ryokan. I mean, you are a grandma’s boy, so it’s perfect. Perty Guest: Mari! You’re missing the party! Mari: I have to go, Sho! Talk to you soon! Sho asks Mari, "Are you taking over the ryokan?" She ( ) to ( ) a picture book writer. She thinks Sho should take over the ryokan. 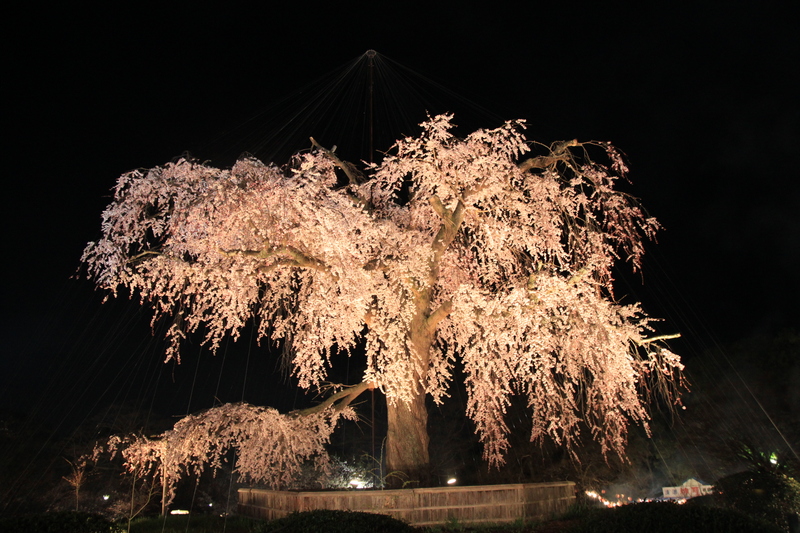 Lesson 011 The sakura are floating in the dark! Sho: Here you go, Dad! I brought you dinner. There’s enough for everyone. Naoki: Dinnertime, everyone! Sho, we just set up some lights in Sakurayama Park. We are going to test them now. Do you want to watch? Sho: Really? I’d love to! Naoki: Ok, everyone! Count down from 3. Ready? Sho: Wow! I think this is great! The sakura are floating in the dark! It’s like a dream! Sho brought some dinner to his father and his friends. They set up some lights in Sakurayama Park. The sakura are floating in the dark. He thinks it's ( ) a ( ). Naoki: Sho! You’re still awake. Sho: If no one can take over the ryokan, what’s going to happen to it? Sho: But…this is my last year of junior high school. Sho is worried about the ryokan, and about high school. Sho is in his last year of junior high school, but Sho's father tells him, "You ( )( ) worry so much." Sorry? Can you speak in a louder voice? Your performance will make people happy. I think this is like a dream! The news will make everyone happy.